When and how should I fertilize the piñon and other pine trees in my landscape? Generally, native plants (including piñon, ponderosa, and some other pines) do not need fertilizer in our soils, especially if they have a nice fibrous mulch layer protecting the roots (more on that later). Appropriate irrigation is the best “fertilizer” for them. Several experts I reached out to said that oftentimes plant water stress is incorrectly diagnosed as nutrient stress. If you rarely or never watered your native trees in the past, start irrigating this season! By lowering water stress, you also reduce many pest and disease pressures. Native or nonnative, all trees deserve deep irrigation (1-3 ft deep is best) out beyond the canopy of the tree where most of the absorbent roots are found (2-3 times as far from the base as the tree is high, or as far as you can). For older columns about irrigating trees properly in New Mexico, go to Desert Blooms and enter “water” in the search prompt. 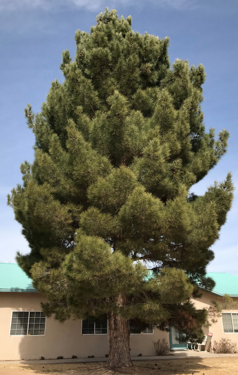 The huge Afghan pines (nonnative) outside my office in Los Lunas and at the Fabian Garcia Science Center in Las Cruces look great and are not fertilized (Fig. 1). Other nonnative pines may appreciate fertilizer, but it really depends on how old the trees are and which species you are growing. Fertilizer is not recommended for newly planted trees. During the first year or so after planting, trees are establishing their root systems, so fertilizer (especially nitrogen that stimulates above-ground growth) will not be appropriate. Figure 1. Afghan pine (Pinus eldarica) at the NMSU Agricultural Science Center at Los Lunas (photo credit M. Thompson). Test, don’t guess. Soil and needle tests will be good indicators of fertilizer needs, if any. Currently, nutrient testing services for plant and soil samples are limited in New Mexico. The good news is that Dr. Owen Burney, NMSU forestry professor at the John T. Harrington Forestry Research Center in Mora, is exploring the development of a plant and soil analysis lab in collaboration with the Highlands University Forestry Program in Las Vegas, NM. This facility will serve the public and researchers in our region, as well as offer educational opportunities to students. In the meantime, helpful resources on how to test your soil and where to send the samples can be found at the website listed above or by contacting your NMSU county Extension agent. Faster growth can be encouraged with the application of a controlled-release fertilizer designed for trees and shrubs up to two times per year. Note: Faster growth does not necessarily mean a healthier plant in the long term. Slow and steady wins the race. If you decide to fertilize, a low-dose N-P-K ratio like 16-8-8 or 12-6-6 will be less likely to harm roots. Dr. Burney warned that you should not fertilize unless you are going to also apply adequate irrigation because the salts in fertilizers can damage active root tips. Another thing to consider is the timing of application. One general rule is to fertilize when plants are actively growing or just before. Here’s how to know in advance: 1) Monitor your pines for signs of new growth. You’ll be able to tell because there will be a new flush of bright-green growth at the branch tips, typically in spring. 2) Then get out your calendar, subtract a few weeks, and mark the date next year to apply a controlled-release fertilizer. Nitrogen tends to be the most limiting nutrient in our soils, partially because plants require large amounts and it is easily lost by leaching or through microbial activity. The problem with fertilizing when plants are still dormant is that the nitrogen may just move down past the root zone and not get absorbed by the tree. Aside from proper irrigation frequency and depth, the single most bestest thing you can do for your plants is apply mulch. Using 2-4 inches of natural mulch (like wood chips) has been proven to maintain moisture levels in the soil and to add organic material to the soil as it breaks down slowly; it also helps suppress weeds, which keeps lawn mowers and weed whackers away from the bark. Injury from weed whackers is a major cause of preventable tree death in our parks and residential landscapes. It is possible that signs of distress are from physical wounds and are not fertilizer-related. Before you apply any fertilizer, check the base of your tree trunks for evidence of damage. Let’s get to the root of the problem – post pictures of your pine tree’s pretty new growth (or sad trunk wounds) on social media: @NMdesertblooms.